SCVHistory.com JD8501 | Film-Arts | Newhall Walk of Western Stars: Jimmy Stewart Regrets, 1985. 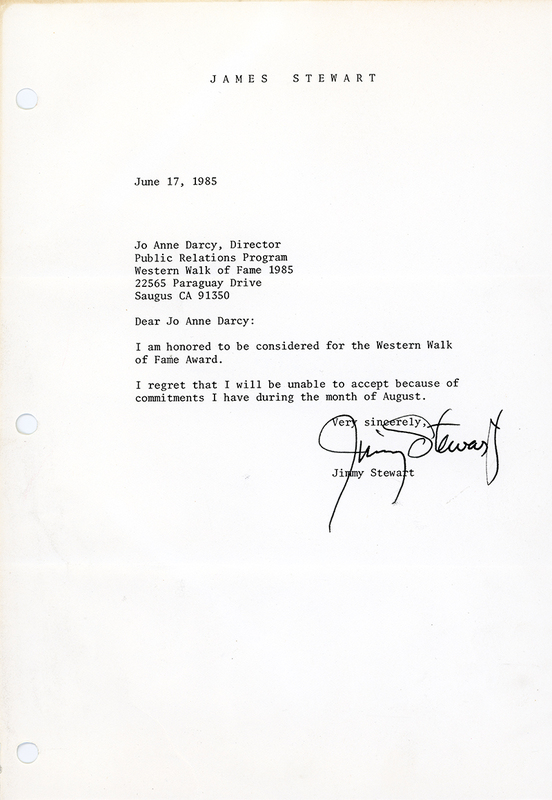 Actor James Stewart regrets to inform Jo Anne Darcy that his schedule won't permit him to accept the honor of induction into the Downtown Newhall Walk of Western Stars in 1985. I am honored to be considered for the Western Walk of Fame Award. I regret that I will be unable to accept because of commitments I have during the month of August. Some research is needed to ascertain the extent of Stewart's appearances in movies that used Santa Clarita Valley locations. Once such film was was 1965's "Shenandoah" with Doug McClure (a 1988 inductee), which partially filmed at Disney's Golden Oak Ranch in Placerita Canyon. Jo Anne Darcy chaired the Western Walk of Stars event (called Walk of Fame until the Hollywood Chamber sued) on behalf of the host organization, the Downtown Newhall Merchants Association (DNMA) and a later spinoff, the Santa Clarita Valley Walk of Western Stars Foundation. Darcy was senior field deputy to 5th District Supervisor Michael D. Antonovich, who served as honorary chairman. (In 1987, the City of Santa Clarita came into existence and Darcy was elected to the inaugural City Council.) Committee members included local general merchant and Walk co-founder Milt Diamond (executive chairman) and auto parts suppliers Bob and Judy Martin. The January 1994 Northridge earthquake dealt a death blow to downtown Newhall, which had already seen its anchor businesses and government services (car dealerships, sheriff's station, etc.) flee for the shiny New Town of Valencia. At least symbolically, the earthquake finished off the Walk of Western Stars event, which saw its last induction in 1993. The last two members of the DNMA were Bob Martin and insurance agent Virgil Saunders, who dissolved the organization in 1995 or 1996. In 1997, Darcy and the rest of the 5-member City Council (then-Mayor Clyde Smyth, Carl Boyer, Jan Heidt, Jill Klajic) launched a formal redevelopment program for the downtown Newhall business corridor. It was slow going at first, but in time, new investment started to come in. After a gap of several years, the Old Town Newhall Association was established, supplanting the old DNMA, and in 2000, the City of Santa Clarita took over and relaunched the Newhall Walk of Western Stars. Bob and Judy Martin's NAPA Auto Parts store became the Canyon Theatre. JD8501: 9600 dpi jpeg from original letter in the Jo Anne Darcy Collection, courtesy of Joleen Darcy, 2018.